In this week's ELH Challenge we're designing a scratch-off game. While I'm not keen on scratchcards, the challenge made me think in the direction of dusting, then erasing, then treasure hunting, then beach combing, archaeology... In the end, I came up with an Egyptian-themed treasure hunt. Check out the published example here. 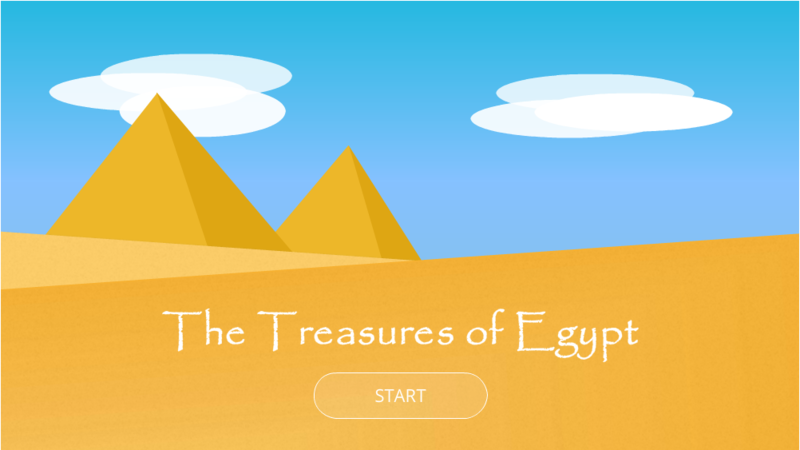 In this interaction, you will need to discover 5 treasures, which will tell you 5 facts about the Ancient Egypt. If you want to see the actual insides of this example, download the .story file here. What I would call out from the start is that few beginners realize that it is possible to make an object draggable with one trigger. Add a trigger with the event "when the object is dragged over" and the Storyline will make anything draggable. Although I'm on my own personal quest to create all my assets by myself in either PowerPoint or Storyline 2, I decided to get help from the open resources. For each treasure I created three states of dustiness in GIMP. I put the treasures between two identical layers of the sand background and used the eraser to gradually remove the top layer, saving copies of the image in the progress. Once I had all my assets, I started assembling the course in the Storyline. I really wanted to have a metal detector in the interaction (as an homage to my previous obsession with archeology and historical reenactment). At the same time, I didn't want the users to simply wave a detector all over the screen and uncover all artefacts. Instead, I wanted to make the task more purposeful and realistic. To simulate the process of identifying the object's location with the detector and then uncovering it, I added "treasure markers" which appear when the metal detector passes over hotspots. The markers in this case are simple circular shapes. Only once a marker (AKA treasure location) is discovered can the brush be used to remove the sand. Having said that, I should note that the actual condition of the trigger is not the state of the marker, but a value of a variable. The reason for this is that I wanted the markers to disappear once the user starts removing the sand (as they would not serve any further purpose). At first, I happily tied the brush mechanic to the state of the marker, only to immediately realize that, quite expectedly, once the marker vanishes, the trigger stops working as well. I solved this by adding a True/False variables "FoundObject" for each hidden treasure. This variable is set to "true"when the metal detector is hovered over the treasure hotspot, thus enabling the intended brush mechanic. Since I didn't want to make my treasures completely clean, I needed to have a way to show to the users that they can stop dusting. At first, I simply added a trigger tied to the treasure's state to show a layer with the information about the artefact, but that felt too disruptive and awkward. Therefore, I added a small "Learn more" text box, which is set to appear once the object has been successfully 'cleaned'. The text box thus serves as an indicator that it's time to stop cleaning as well as the trigger to show the layer. In addition, this solution allows the user to decide when and how often to view or re-view the information that the artefacts are hiding. As ELH challenges are something I do in addition to a very full time job, I did not create a perfect and sophisticated gamified experience, focusing mostly on practicing my triggers and experimenting with the sandy textures (I also contemplated an idea of making a Zen-garden interaction). But there are many ways how this interaction can be developer further. For a more gamified spirit, you can turn the interaction into a quiz. For instance, instead of presenting the facts, you could ask the learners to identify uncovered treasures, turning it into a quiz. Or you can make such a treasure hunt an optional activity within your course, allowing learners to use the discovered treasures (and learned facts) to either "buy" additional course credit or, perhaps, to "pay their way out" during certain activities or questions within the course.